4 short vowel words in a row earns you a BINGO. The players’ Bingo boards are identical. Since more than one vowel will work in most of the words, not everyone will get a Bingo at the same time. The die is rolled by one player who calls out the short vowel sound. Everyone uses that same vowel to make a real word on one square. On the sixth side of the die there is a * which allows the roller to choose the vowel. 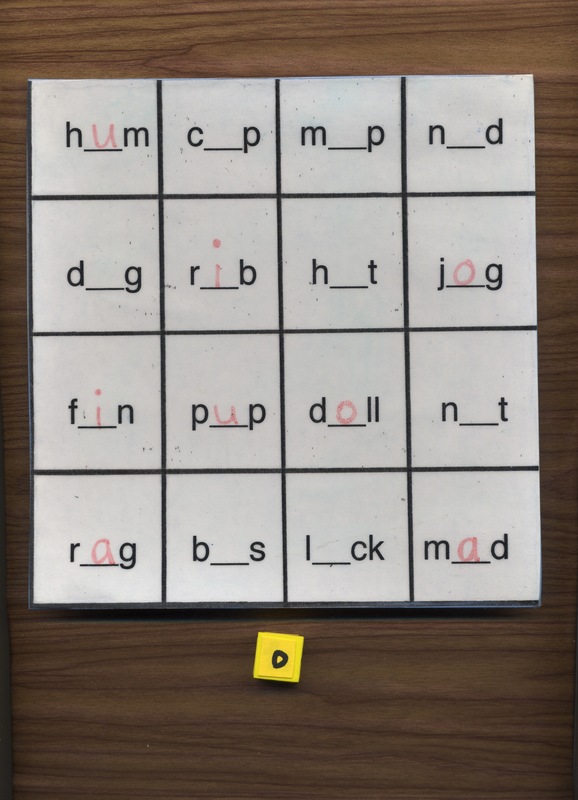 One of my groups, however, decided that the * indicates that each player can choose his or her own Free Choice vowel. That’s your call. The game is over when each player has at least one Bingo. Or you can play until all players have a Blackout, where every single square of the board is filled. This entry was posted in Reading Games on May 1, 2014 by lwhulbert.